Federal officials report that 18 million more trees have died in California since the fall of 2017 – and that’s a bit of a relief. “It’s better news than the previous few years,” says Randy Moore, regional forester at the U.S. Forest Service. Wetter weather has slowly improved conditions for thirsty pines, firs and other conifers in the last two years. A previous mortality survey in 2017 found 27 million dead trees. Before that, in 2016, federal scientists counted 62 million. But the latest aerial surveys boost the state’s tree-body count to at least 147 million, a staggering total since 2010, when a five-year drought set in, worsening infestations of bark beetles, and driven by climate change. Bark beetles gained “a real big advantage” over weakened trees when the drought began nine years ago, according to Moore. “The bugs were beginning to eat at a higher level than they normally would, because with a change in climate, it’s warmer at a higher elevation,” he says. 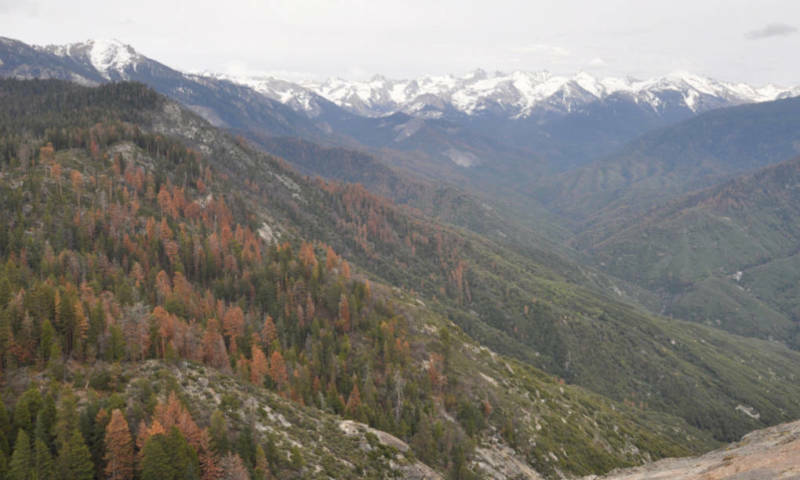 The worst-hit forests are found along the west side of the central and southern Sierra Nevada range, though surveys show dead and dying trees across the state, especially at higher elevations. Trees in poor health amplify fire risks, a concern after the deadliest wildfires in California's history. Even where fire is scarce, sickened trees can fall across roads and power lines unexpectedly. Established last May, a Forest Management Task Force comprised of more than two dozen federal, state, and local agencies has cleared trees and other forest debris along roads, near power lines, and around 165 communities in the wildland-urban interface, according to Moore. In the longer term, he says government land managers have committed to management strategies that thin forests, including by using prescribed burns across the landscape. “Between the federal government and the state, we’ve decided that we need to treat a million acres in California a year, that’s what we’re working toward,” says Moore. Reducing biomass and fire fuels in a forest is complex and expensive work, much of it funded by the State of California. In his first budget, Governor Gavin Newsom proposed spending $305 million on forest management, including $200 million from a 5-year, $1 billion program approved by lawmakers to support fire prevention efforts.